Present state: The station building has been renovated and now houses Waterside Heritage Centre. The site of the goods yard is now occupied by housing. 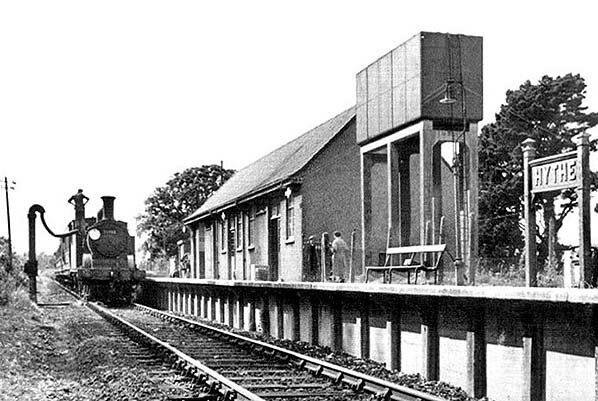 The plain utilitarian single-storey station building was similar to those at Fawley and Marchwood but without the central gable. It was of concrete construction with a red tiled pitched roof. The building comprised the ticket office, parcels office, goods store, booking hall and waiting room, men's and ladies’ toilets, a porters’ room, coal store and a lamp room. Radiators were supplied from a Sentry boiler in the parcels office. 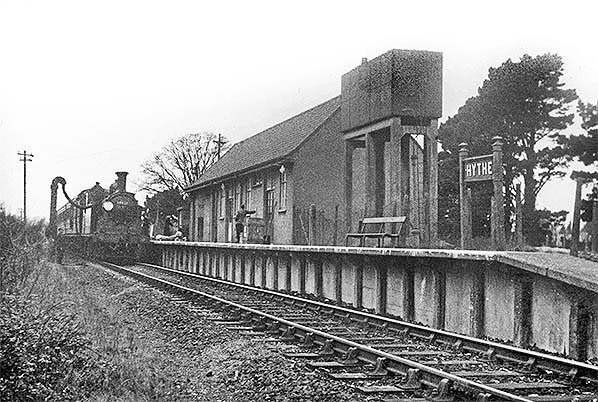 Hythe was the only station on the line to be lit by electricity and had four barley-sugar twist lamp standards, three to the north of the station building and one to the south. The three to the north had Southern Railway 'target' nameplates fixed to them, but that to the south, from photographic evidence, had no signs. A further three target signs were mounted on the station building. Hythe station was never fitted with 'totem' signs in BR days. Southern Railway concrete running-in boards were provided at each end of the platform. 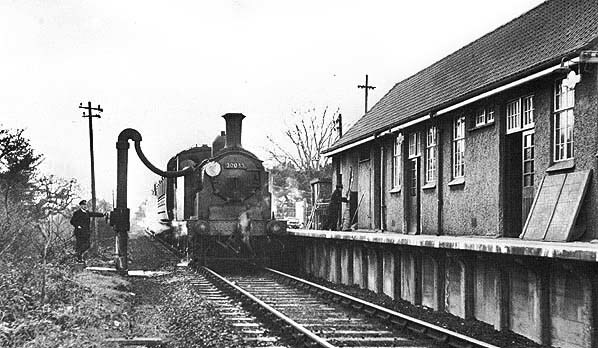 The Fawley branch had a number of ungated level crossings and no locomotive turning facilities, therefore motive power in steam days was restricted to tank locomotives. To service these, a water column was provided on the up side opposite the north end of the station building. It was fed from a tank standing on six tall concrete legs at the back of the platform at the north end of the station building. The water tower at Fawley was away from the platform and adjacent to the refinery exchange sidings, so not always convenient for Southern and BR locomotives to use. Thus watering facilities were also provided at Hythe which were more convenient, at least from the staff point of view. Following the end of steam on the branch in the early 1960s the tank and column were removed. At the south end of the station a single siding served a cattle dock with movable cattle pens on it; in later years the station no longer handled livestock. Access to the siding was controlled by Hythe East Ground Frame. Topography dictated that the main Hythe goods yard was at a lower level than the Fawley branch; it was located between the station and Shore Road. The junction for the goods yard was some considerable distance to the south of the station and was controlled by Hythe West Ground Frame. Close to the junction there was a loading gauge and some distance beyond that the yard opened out with two diverging sidings. The only covered accommodation appears to have been the grounded van body. A 10-ton capacity crane was provided between the two sidings. A short distance south of the junction with the goods yard siding the line crossed Frost Lane. 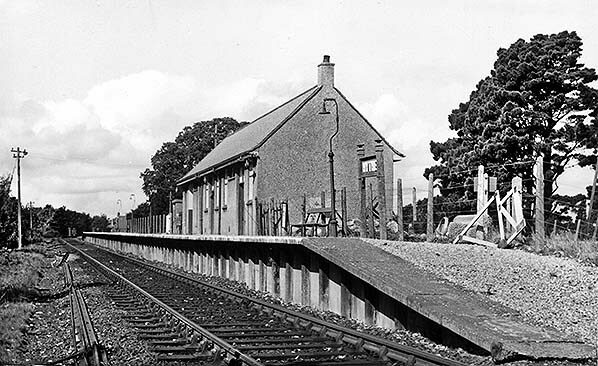 The level crossing was one of a number of ungated crossings on the Fawley branch, and it is surprising that upgrading did not occur until 1961 when Frost Lane signal box was built. Frost Lane Crossing received new lifting barriers, operated from the signal box. The box also unlocked Hythe East and West ground frames. Today Frost Lane crossing is AHB (Automatic Half Barrier), as are other formerly ungated crossings on the line and all trace of the box has gone. Hythe station closed to passengers on 14 February 1966 and goods on 2 January 1967. The dock siding were quickly lifted but the goods yard sidings survived into the 1970s. The platform was largely demolished in the early 1970s. The single-track line remained open to serve Fawley Refinery but is now ouit of use following the ending of crude oil traffic to Fawley on 1 September 2016. After closure, the station building was leased to light engineering company but by the early 1970s it was empty and began to suffer from neglect and vandalism with some internal fire damage. The building remained empty for over 20 yeras until 1995 when the whole station site (station and goods yard) was offered to a housing developer. The initial plan was to demolish the station building and build a children's playground on the site. Instead however the station building was acquired by Hythe & Dibden Parish Council to house the Waterside Heritage Centre which had been looking for a permanent home for a local record office and study centre for the Waterside parishes. The centre is open 10.00 - 13.00 on Tuesdays, Thursdays and Saturdays. The site of the Hythe goods yard is now a housing development. In June 2009 the Association of Train Operating Companies published a report (Connecting Communities: Expanding Access to the Rail Network) strongly indicating that the reopening of Hythe railway station would be viable, in that the ratio of business, economic and social benefits to costs would be as high as 4.8.The ATOC report gave the indicative capital cost of reopening as £3 million. ATOC's evaluation was based on a diesel service, but it recommended that electrification of the seven miles from Hythe to Totton should also be evaluated, on the basis that some services now terminating at Southampton could be extended to Hythe. In January 2014, Hampshire County Council shelved the plans owing to the business case 'offering poor value for money'. The scheme could, however, be revisited in the future if local circumstances change. 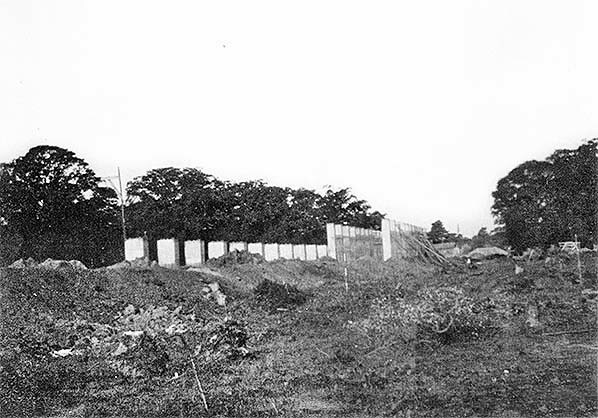 Hythe station under construction in 1924 and if the trees are anything to go by during the summer of that year. Hythe station is approached from either direction on low embankments, but this view apparently shows a flat landscape so is difficult to orientate. However, by comparison with photographs taken after the line opened the tree on the left suggests this view is looking towards Fawley and the trackbed is therefore to the right of the earth bank with narrow gauge track on it. It is difficult to suggest the purpose of the wooden structure in the foreground. 1932 1:2,500 OS map shows the layout of the station as built. The station is along a short approach road off Shore Road. The station building is towards the east end of the platform with a water tank to the rear of the platform just east of the building. A single siding serving a cattle dock is seen to the east of the station. The goods yard is clearly at a lower level at the bottom of an embankment behind the station. There are two diverging sidings with the 10-ton yard crane standing between them. The grounded van body is seen at the end of one of the sidings. The large building on the right is the Supermarine seaplane assembly factory. Langdown Park is seen at the bottom of the maps; the railway cut through the northern edge of the park. The large hotel opposite the goods yard predates the railway. 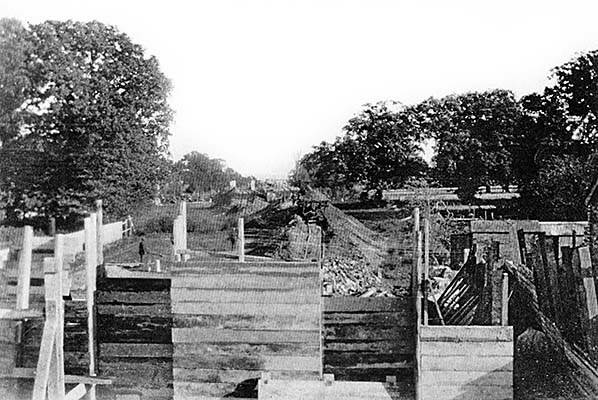 Hythe Station foundations under construction in 1924 looking towards South Street. The columns on the right would be capped with a concrete slab to support the station building. The lower row on the left, which appear to be only partially completed would support the outer edge of the platform. They were probably wider to take the sideways pressure from the embankment. The first up train, i.e. from Fawley, is seen at Hythe station on the opening day 20 July 1925. The locomotive, partly visible here, was an Adams Class O2 0-4-4T from the 'stovepipe' batch - a reference to chimney style. Note the platform lighting with barley-sugar twist standards and swan-neck brackets, electrically lit from the outset. Provision of electricity was hardly surprising given the industrial nature of Hythe, but was in total contrast to Fawley station which was oil lit at the outset. 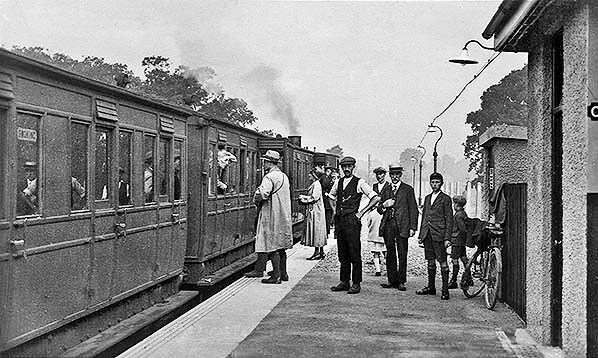 Notwithstanding this photograph clearly involving a degree of posing for the camera, the calling of branch line trains at stations during this era could be a leisurely affair. This is in contrast to today where there is an ever present feeling of urgency and trains with power-operated doors having a typical dwell time of thirty seconds at intermediate stations. A few people on the platform at Hythe are 'seeing off' friends or relatives but it is impossible to tell how many people actually boarded the train. As always, staff are plentiful and apart from the gentleman facing the camera there is a staff gathering near the locomotive. A rare view of a tender locomotive on the Fawley branch, an unidentified Adams Class A12 0-4-2 on a goods train in June 1948. Known as 'Jubilees' because they were introduced in the year of Queen Victoria's Golden Jubilee, 1887, it was one of this class, No.605, which was involved in the 1926 accident at Frost Lane level crossing when it destroyed a Wolseley motor-car. Withdrawal of the class began in 1928 and during WWII several of the survivors, along with members of other classes, were used as makeshift air-raid shelters by the simple expedient of placing them over inspection pits at various sheds and workshops. Forty of the class were built by Neilson & Co and were officially Class O4. They had a number of differences to the A12 but the whole lot were, probably for convenience, lumped together under the A12 banner. The class was a rare example, in Britain, of the 0-4-2 tender type. 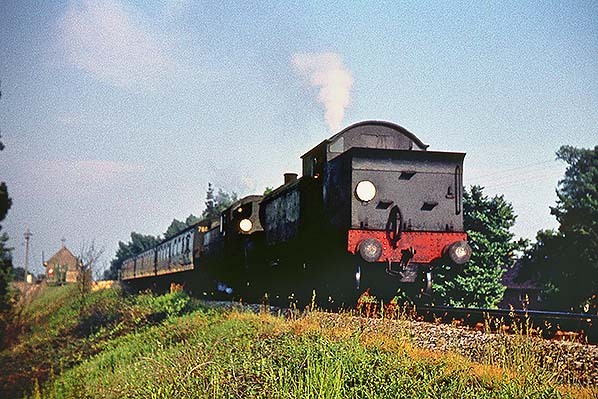 Just four survived to see British Railways but the class became extinct during 1948 with none ever receiving a BR number and it is likely none were even allocated. On the platform at Hythe, a large number of crates are stacked. Presumably they await loading, or have been unloaded from, a passenger train although a number of them appear to be empty. No close-up photographs of Hythe's water column are known to exist but this one offers a reasonable view. The upper part appears to be quite ornate. We are also offered a reasonably close view of the water tower with its typically Southern concrete base. Both items disappeared quickly following the end of steam on the branch. Drummond Class M7 0-4-4T No.30032 takes water at Hythe in January 1956. This locomotive was one the class known to have regularly worked the Necropolis train taking the dead and mourners to Brookwood Cemetery, described in a little more detail on the Fawley page. The provision of a water tower and column at an intermediate station on a fairly short branch may seem a little odd, especially when facilities were provided a short distance away at Fawley. 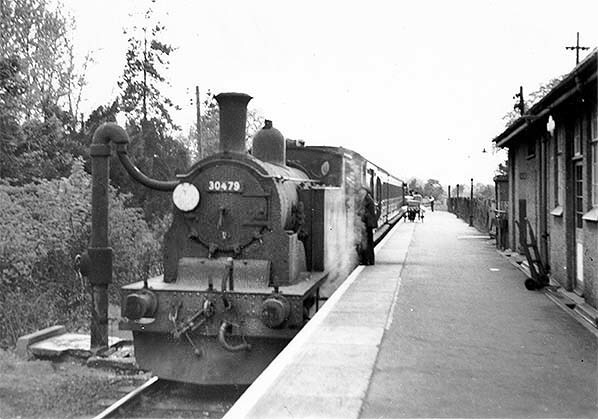 The Fawley branch had a number of ungated level crossings and no locomotive turning facilities, therefore motive power in steam days was restricted to tank locomotives. 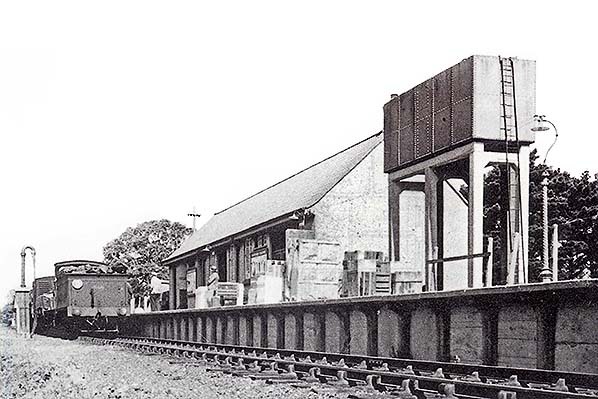 The water tower at Fawley was away from the platform and adjacent to the refinery exchange sidings, so not always convenient for Southern and BR locomotives to use. Thus the facilities at Hythe were more convenient, at least from the staff point of view. During WWII Southampton was a Luftwaffe target and watering facilities at both Hythe and Fawley provided insurance should bombing effect this side of Southampton Water. Hythe's water tower and column, believed provided from the outset and certainly present in 1932, were removed following the end of steam on the branch. Visible on the station building are three Southern 'target' nameplates, the electric lights which illuminated them being difficult to discern. Drummond Class M7 0-4-4T No.30032 takes water at Hythe in January 1956. The provision of a water tower and column at an intermediate station on a fairly short branch may seem a little odd, especially when facilities were provided a short distance away at Fawley. During WWII Southampton was a Luftwaffe target and watering facilities at both Hythe and Fawley provided insurance should bombing effect this side of Southampton Water. Visible on the station building are three Southern 'target' nameplates, the electric lights which illuminated them being difficult to discern. Sometime during 1956 Drummond M7 class 0-4-4T No.30130 take on water at Hythe whilst on its way to Fawley with the branch passenger train. Water columns and water cranes differed by virtue of the latter having a counterbalanced swinging boom. That at Hythe, as seen here, was a water column and to a Southern Railway design. They were not the most aesthetically pleasing of structures. Quite why the column was placed where it was and not nearer the camera is puzzling as it limited the length of passenger trains which could stop at Hythe's 350ft platform. Not, of course, that the infrequent branch services ever warranted lengthy trains. Hythe's column and water tower were removed shortly after the end of regular steam on the branch. No.30130 had a couple of spells at Eastleigh shed during the BR period; from August 1954 until June 1958 and from March 1959 until withdrawn in December of the same year. The need for fireman to climb onto tanks (and tenders) when taking on water is well illustrated in this view. This was major safety issue on other regions where overhead electrification was in place and following a number of incidents including at least one death (of a driver at Hythe, Essex) was born the overhead warning flashes so familiar today. Drummond Class M7 0-4-4T No.30479 takes advantage of the Bulleid water column at Hythe whilst in charge of a Fawley-bound passenger train. The date is unknown but it is after 1950, when BR began applying shedplates to non ex-LMS locomotives, and before April 1961 when No.30479 was withdrawn. This locomotive is known to have been fitted with snowploughs, as seen here, during the winter of 1957/8 and was still so-fitted in April 1958. This should not be taken as evidence of an approximate date for this photograph though, as not all locomotives were fitted with snowplough brackets so No.30479 may have carried ploughs on several occasions if not continuously over a number of years. The leading carriage is of interest, being fitted with a sliding door to the brake compartment. Unfortunately the camera angle makes it difficult to determine if there are one of two such doors; the LSWR built both types, most of which were Lavatory Brake Thirds. In typical Southern fashion they were part of numbered 3-car sets and lasted well into BR days as evidenced here. On 3 June 1960 and photographed from an unusual vantage point, a passenger train seemingly departs Hythe for Totton and probably Southampton Central. South Street bridge is just behind the camera. The pilot (leading) is Class H16 4-6-2T No.30516. The train engine (the usual term rather than 'train locomotive') is identified only as a BR Standard 2-6-2T. Precisely what is going on needs a little detective work to determine. The train will not have required two locomotives and the H16 may be working back, probably to Eastleigh, having worked to Fawley earlier in the day with a tank train. Returning light locomotives ('light' means a locomotive running on its own) to depot by this means was and is common practice as it saves a path (basically a slot in the working timetable). Alternatively and more likely, the lack of any under-power exhaust, the faint whiff of smoke from the H16 drifting straight upwards and the crispness of the photograph suggest the train is stationary. This implies the 2-6-2T had failed and the H16 sent down the line to rescue it. The headcode disc on the bunkers of both locomotives might support this theory. The train is a Bulleid 3-set and it appears to be No.784. Assuming this to be correct, this set comprised BSK S4327S + CK S5764S + BSK S4328S. It was one of a large batch of 3-sets allocated to Waterloo - Weymouth/West of England routes and which in 1960 ran from set 770 to set 793, all being formed new in 1947. They were used on local and branch services, as here, or for strengthening other sets at busy times. They could be seen as far west as Padstow and their formation with a brake at each end was useful for the ‘Atlantic Coast Express’ which joined and divided along the way in order to serve various locations, perhaps most famously at Halwill where portions for Bude and Padstow divided and joined. Frost Lane level crossing with work ongoing in connection with the new signal box in 1961. 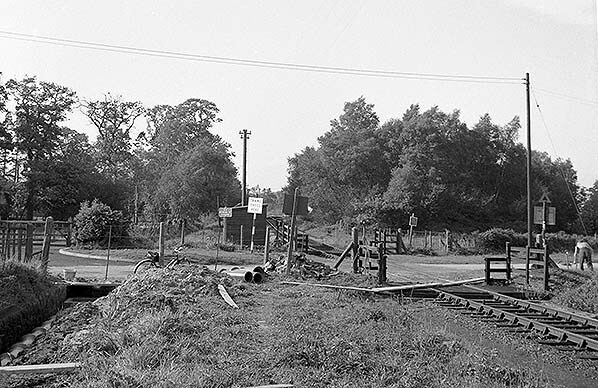 This crossing, one of a few ungated crossings on the Fawley branch, was the epitome of a Light Railway 'economical' level crossing and it is surprising that upgrading did not occur until the 1960s. The work seen ongoing was in connection with the new Frost Lane Crossing signal box. A workman can be seen on the right and he has wheelbarrow planking across the track. Various signs from a bygone age can be seen dotted around the crossing; 'SR Beware of Trains' trespass warnings plus two of the old style 'Trains Cross Here' road traffic signs with warning triangles containing what we used to call 'fruit gum' reflectors. It is known, perhaps obviously so, that the road approaches to Frost Lane Crossing also had the pre-Worboys ungated level crossing signs which depicted a representation of a steam locomotive in silhouette and again with warning triangle and 'fruit gums'. These signs are out if view in this photograph. It is interesting to note that to this day modern ungated railway (as opposed to tramway) level crossing warning signs still depict a steam locomotive. On the other side of the level crossing and to the right of the hut can be seen a 'T' sign. These were illuminated during the hours of darkness and indicated the end of a temporary speed restriction. There is another sign opposite and facing the other way; this will be a commencement of speed restriction sign and advanced warnings would have been positioned further along the line. These signs are still in use today albeit in modern form. The purpose of the hut and, indeed, its origin is unclear. It may have been for the use of a flagman or, possibly, contained a ground frame for the points visible in the background but if the latter it would, one would have thought, been closer to the points. The points gave access to a single-ended siding, the purpose of which is unclear. The camera is looking towards Hythe and behind the camera was a loop. Signalling diagrams show it as 'Up Loop' and 'Down Loop' which in effect meant a short section of double track. Unsurprisingly the ungated crossings on the Fawley branch witnessed a number of mishaps. Staying with Frost Lane a collision between a car and train occurred at 3.21pm on 15 November 1926. The train was the 3.15pm goods from Fawley (a 'special' goods according to the subsequent Ministry of Transport Report) and the car, a Wolseley 10½hp open tourer. The car was destroyed but its occupants, an RAF officer who was driving, his wife, four year old daughter and an aunt were thrown clear by the impact and all survived. The locomotive was 0-4-2 tender No.605 and the train comprised eight empty goods wagons, six loaded petrol tankers and a brake van. Damage to the train was minor. 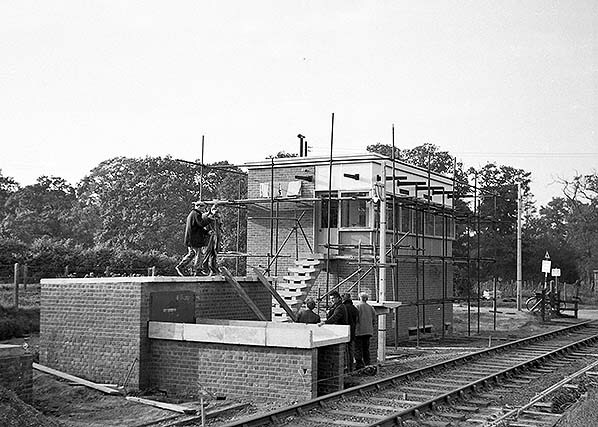 Frost Lane Crossing signal box under construction in 1961. In comparison with the close-up view of the level crossing, we can see a signal has appeared while, right, signal wires and point rodding are in place. 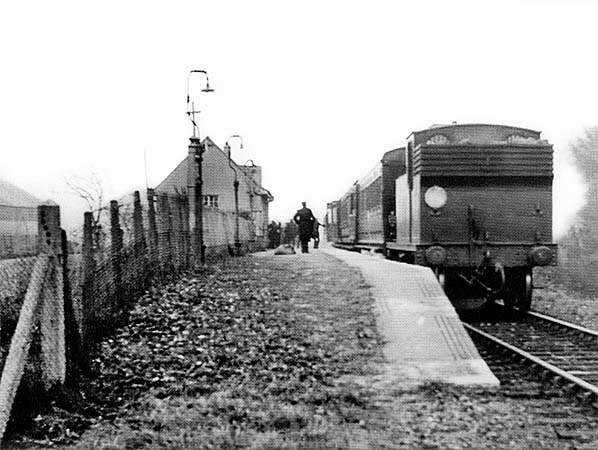 In the background, facing the siding and partly visible to the right of the signal is a shed or cabin of some description. Frost Lane Crossing was to receive lifting barriers, presumably operated from the signal box. Behind the camera were the up and down loops, each being provided with spring-operated trap points and with points at the convergence and divergence of the loops being motor-operated. The rodding on the right is linked to the box beneath the track and via the low brick structure ahead of the camera. The rodding route is both towards Fawley and Hythe; some will operate the points to the siding with the others probably being for facing point locks at the loops. Apparently this box also unlocked Hythe East and West ground frames, i.e. to Hythe dock and goods yard. For the job intended of it, Frost Lane Crossing box was a quite large structure. What looks like workmen’s clothes hanging out to dry on the end wall of the box are in fact sheets of something covering the nameplate. On this end of the box the nameplate was mounted as seen. On the other end, the end windows extended the full depth of the box and part way around its rear to provide a good view of the crossing and road. On this end, therefore, the nameplate was mounted below the windows. In both cases the name was presented on two lines; Frost Lane at the top and crossing at the bottom with, it would seem, black lettering on white background. The steps up to the box were on this end of the building and had yet to be completed when this photograph was taken. Southampton Water is but a short distance to the right of this view and Frost Lane is a continuation of Shore Road. Today Frost Lane crossing is AHB (Automatic Half Barrier), as are other formerly ungated crossings on the line. The box has gone and, with woodland having now encroached up to the lineside, there is no obvious evidence that the box ever existed. 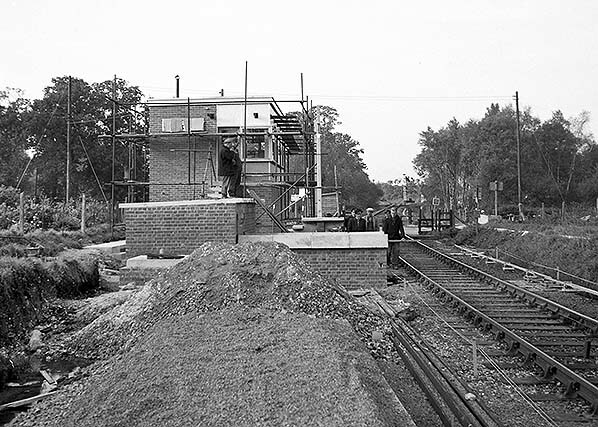 Frost Lane Crossing signal box under construction in 1961. This angle gives a rather better idea of the appearance of the box and of the yet-to-be-completed access steps carefully moulded in charming concrete. A point of note is the two Southern Railway style concrete lamp standards. Under close examination they appear to be brand new as opposed to salvaged from elsewhere. The largely brick construction of the box made a welcome change from the dismal structures found elsewhere along the line. On 10 March 2014 Network Rail and others descended upon Frost Lane Crossing to record a safety training video. Stars of the show were Class 66 No.66181 and an articulated flatbed lorry. There were no collisions or even near misses and the Class 66 was stationary for much of the time.